Germany offers a diversity of attractions for the motorhome traveller. Drive down to some of the numerous wine and beer festivals or visit some of the historic castles and palaces found all over the country. You can take in some wonderfully preserved medieval towns or motorhome down to a wide choice of vibrant modern cities offering great cultural entertainment. 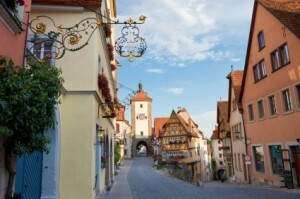 With an incomparable natural landscape, ranging from high Alps to dramatic gorges, huge silent forests and rugged coastline, Germany is great fun to explore. The road infrastructure in Germany is second to none in Europe and makes touring the country easy and pleasant. Wine and beer festivals take place all over the country from spring through to autumn: a perfect choice for an Easter getaway or a motorhome trip in the Autumn half-term holidays. Many wine festivals take place in the region of the Rhine and Moselle, where every town has its traditional annual festival. If you are a motorhome user interested in art, then Berlin is the natural destination for you. Germany’s capital city is important in terms of its performing arts, museums and collections and will not disappoint. However, if you wish to experience something less mainstream, cities such as Munich, Hamburg, Dresden, Leipzig, Stuttgart, Frankfurt, Düsseldorf and Cologne offer an extensive cultural programme. The Wagner festival, held annually at Bayreuth is an exciting option for the more cultural motorhome user. Germany is proud of its cultural heritage and makes a great destination for a cultural motorhome trip. Tour the famous heritage sites of Bamberg, Goslar and Lübeck which all enjoy UNESCO World Heritage Site status. Other sites of historical interest include Heidelberg, Passau, Regensburg, Aachen, Bremen, Trier, Hamelin and Coburg all perfect for motorhome trips. Germany is famous for its castles and no motorhome holiday in the country would be complete without at least one of the several hundred available. German castles are as different as they are varied. From the fairytale castle built by King Ludwig II to the infamous Colditz Castle, used as a prisoner of war camp during WWII. Drive your motorhome through ancient forests and woods while enjoying the imposing backdrop that Germany’s castles create.You can trek up snow covered mountains. With jousting, feast, banquets, concerts and theatre performances a day out at a castle has so much to offer for a motorhome holidaymaker looking for a cultural trip. In terms of natural beauty,Germany excels in offering motorhome users a variety of different landscapes and truly breath-taking scenery. Travel to the Rhine valley to take in one of Europe’s most famous rivers or visit the Moselle valleys. Bavarian Alps and lake-lands offer dramatic views while the Baltic coast is a great place to relax. In a motorhome you can take in a variety of locations in a single trip. Drive your motorhome to the Harz Mountains, Lake Constance, Saxon Switzerland, the Black Forest, the Bavarian Forest and the volcanic Eifel region at your own pace stopping when you wish to truly appreciate all the regions of Germany at their best. Motorhome Hire Germany is a holiday to remember!